Want to design your own video games? Let expert Scott Rogers show you how! 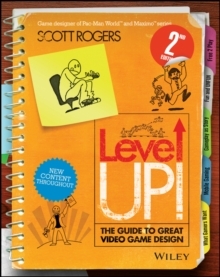 If you want to design and build cutting-edge video games but aren t sure where to start, then the SECOND EDITION of the acclaimed Level Up! is for you! Written by leading video game expert Scott Rogers, who has designed the hits Pac Man World, Maximo and SpongeBob Squarepants, this updated edition provides clear and well-thought out examples that forgo theoretical gobbledygook with charmingly illustrated concepts and solutions based on years of professional experience. Level Up!2nd Edition has been NEWLY EXPANDED to teach you how to develop marketable ideas, learn what perils and pitfalls await during a game s pre-production, production and post-production stages, and provide even more creative ideas to serve as fuel for your own projects including: * Developing your game design from the spark of inspiration all the way to production * Learning how to design the most exciting levels, the most precise controls, and the fiercest foes that will keep your players challenged * Creating games for mobile and console systems including detailed rules for touch and motion controls * Monetizing your game from the design up * Writing effective and professional design documents with the help of brand new examples Level Up! 2nd Edition is includes all-new content, an introduction by David God of War Jaffe and even a brand-new chili recipe making it an even more indispensable guide for video game designers both in the field and the classroom. Grab your copy of Level Up! 2nd Edition and let s make a game!